The loot box system is garbage, both because it exists and because it's uninteresting. We’re over a year into Microsoft’s “Xbox Play Anywhere” program and it still feels novel. 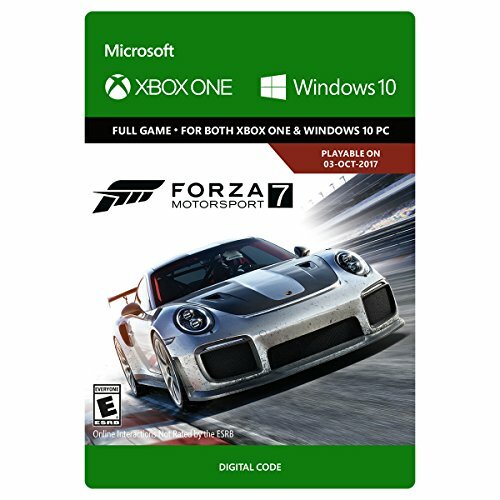 Case in point: This week I’ve been playing Forza Motorsport 7 ($60 on Amazon) on PC, a sentence I never thought I’d say even four years ago, when the Xbox One released. And oh sure, it’s technically not the first Forza game on PC. That award goes to the experimental half-port Forza 6 Apex in 2015, to say nothing of last year’s excellent Forza Horizon 3. Forza 7 is the first of the sim-Forzas to make it over to PC completely intact, though. All the cars, all the tracks, all the showcases—they’re all here, but with the potential for 4K resolution and however many frames per second you can power. Oh, and all the loot boxes too. More on that later. First of all, Forza Motorsport 7 looks great—for a Forza game. Better-looking racer games exist, and there’s a definite “Forza” look to it: a bit softer around the edges, a bit more cartoony. Flipping back and forth between it and Project Cars 2 ($60 on Steam) over the weekend was interesting. Both look good, but Project Cars just looks crisper, more real. 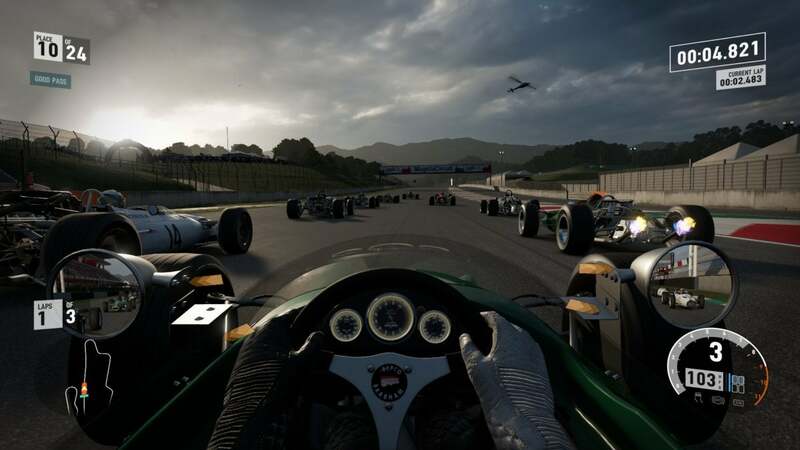 And this is a weird one, but I think the field of view is better in Project Cars 2. Everything seems scaled better there. Performance is great on my GTX 980 Ti, though. In 10-plus hours I’ve experienced maybe two moments of slowdown in Forza 7, both seemingly random, with no pattern I can discern. And the rest has been rock-solid, hitting 60-plus frames per second whether I was going 10 miles per hour or 160. That’s more than I can say about the Forza Horizon 3 port last year. Racing wheel support also seems good. 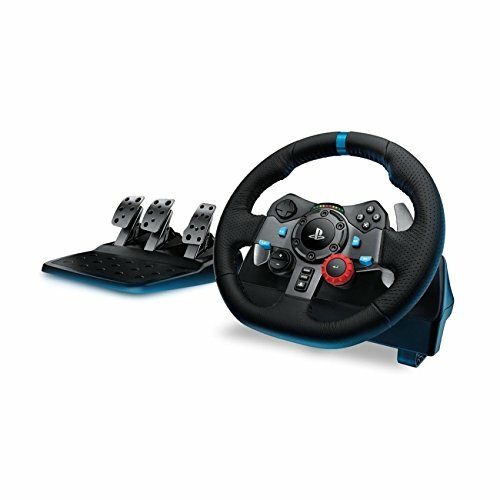 Even my PS4/PC-specific Logitech G29 ($282 on Amazon) was recognized—a fact that surprised me, given this is technically an Xbox game. There were a few quirks, like the Square button being used for Cancel instead of Circle, but the Force Feedback wheel itself worked fine, as did the pedals. I can deal with some interface quirks as long as the key pieces function. So how does it play? 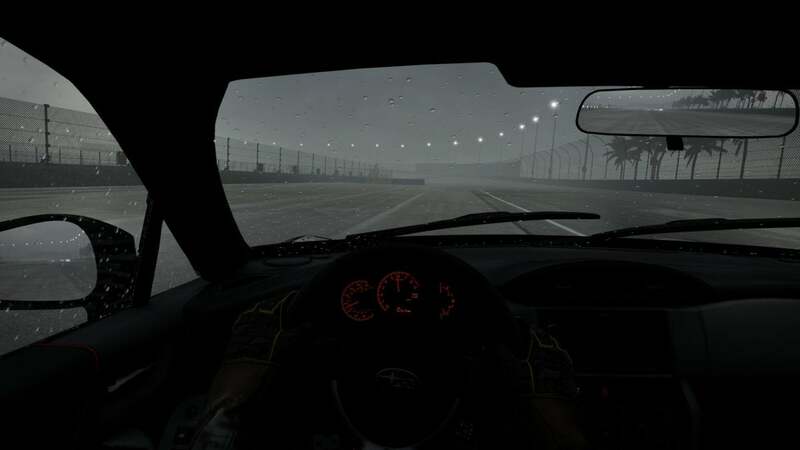 I’ll admit I’m not much of a sim racer enthusiast, preferring the antics of a Forza Horizon or other arcade racers, and have a tendency to play sim racers as if they were just a more challenging arcade racer—drifting, full throttle, music blaring, and more than a little contact between me and my fellow racers. Yes, I’m one of those Drivatars you hate to race against. Then again, so are all my friends, apparently. Five years into Forza’s Drivatar experiment, where you race against AI facsimiles of your friends, and all I’ve really learned is that my entire friend group drives like it’s buy-one-get-one admission for bumper cars. Even with a checkbox for “Limit Aggression” checked, those hairpin turns still just devolve into car-wrestling. This stands in stark contrast to, say, Project Cars 2, where you’re penalized for every single transgression. Took a turn too fast in Project Cars 2 and went off track? Your time no longer counts. Ran into another vehicle? Your time no longer counts. Cut another vehicle off too aggressively? 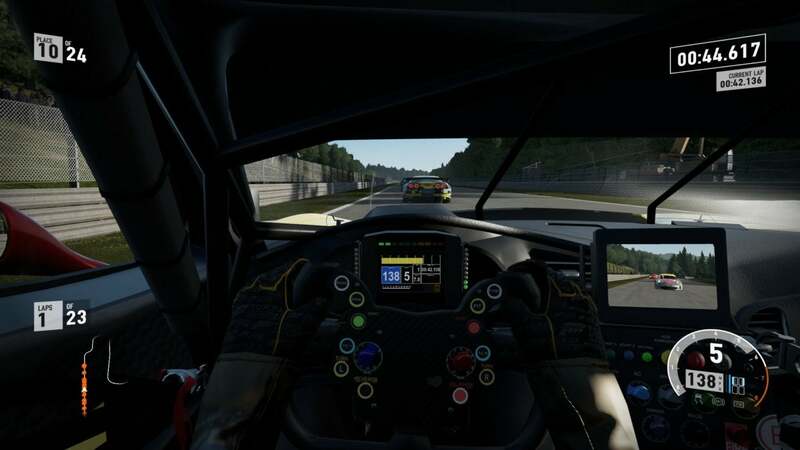 Project Cars 2 gives you 10 seconds to fall back into your old position or else—you guessed it—that’s another penalty. Forza Motorsport 7 is pretty friendly toward those coming from (or who generally prefer) arcade racers. 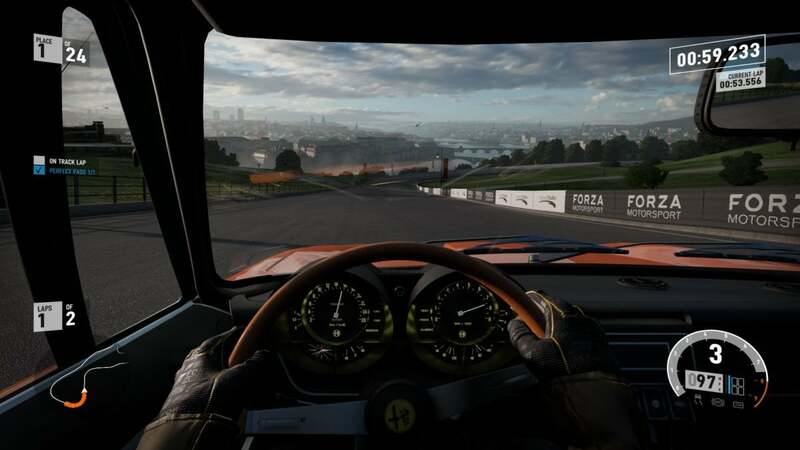 Sure, the presentation here is more realistic than Horizon’s, the focus on trimming seconds off your fastest lap speeds instead of the extravagance of an open-world race. But rules-wise, Forza 7 just gets out of the way. It’s not so much sim as sim-lite. That goes for the driving, too. Even with all the handling assists turned off, I felt like I could push cars in Forza 7 pretty hard—certainly harder than I’d be able to get away with in Project Cars 2. And I know that for a fact, because I spent 45 minutes driving a Porsche around a track in Project Cars 2 before I managed to make it a full lap without spinning out. Forza’s cars have a lot more traction than I think is strictly realistic. More braking power, too. Which is not to say Forza 7 is easy. It’s not, and when you stop leaning on the Rewind crutch—tap “Y” to back up the race 3 to 5 seconds, perfect for when you do spin out— and turn off all the assists, Forza 7 can approach sim levels of complexity. At higher levels you’re going to want to tune your car, run practice laps, and all that. Track conditions seem emphasized this time around, too. My favorite is the backside of the fictional Dubai street course, where sand starts whipping across the asphalt. A unique challenge. Even so, we’re still talking sim-lite (or arcade-sim if you prefer). This is compounded by the fact that Forza still doesn’t include any sort of qualifying system—a glaring omission after playing Project Cars for any length of time. In Forza you always start at the back of the pack, no matter how well you did in your previous race or how skilled you are compared to your competition. It’s a bit weird. Anyway, this shouldn’t surprise anyone who’s played a mainline Forza before. These same pros and cons have been leveled at the series for years, and it’s clear at this point that Turn 10 is content to tweak the presentation of races more than the races itself. 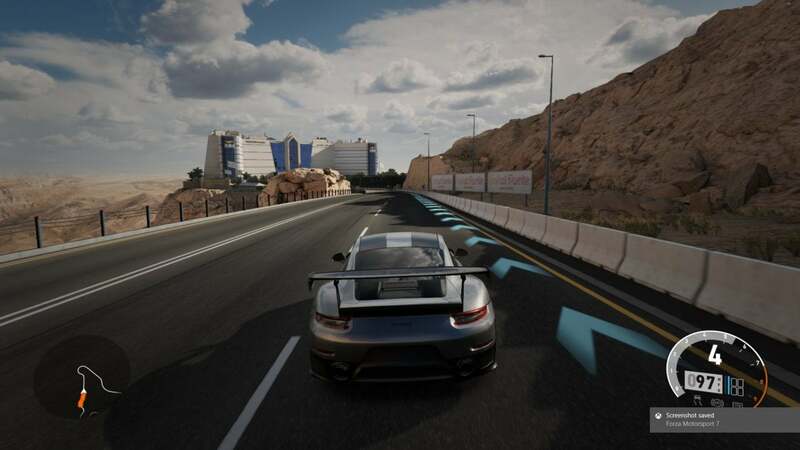 On that front, Forza 7’s been reworked in myriad small ways. Probably the most notable is that in addition to your driver level, which you boost by competing in races, you now also have a “Collection Level.” This is a score assigned to your garage basically, boosted by buying or earning new cars. There are a lot of cars in Forza 7, which is definitely one area where it holds an advantage over its rivals. The catch: You can only buy rarer (and better) cars once you’ve raised your Collection Level appropriately. Want that Bugatti Veyron? In the past the only roadblock would’ve been raising enough funds to get it. Now, you’ll need not only to have the credits on-hand, but also to possess enough lower-level (more boring) cars to qualify. On the one hand, I kind of like the new system. It encourages players to deviate from their usual patterns, maybe buy that weird rally car or boxy 1969 Volkswagen or whatever. I’ve found myself collecting cars I’d never have given a second look to before, just to boost my Collection Score. I guess the hope is that since you already own it, you’ll drive it too. Will you, though? Probably not, and it just ends up feeling like clutter. It’s also yet another layer of artificial gating to an already heavily gated game. This is even more frustrating because as you work your way up through the various championships on your way to the eventual Forza Cup, you’ll start seeing races you could compete in, if only you’d bought enough cars to raise your Collection Score to the appropriate number. When your options are “Spend 30 minutes driving SUVs you don’t care about” or “Buy enough cars to eventually enter the vintage sports car tournament” you end up heading to the dealership and buying a handful of random vehicles just to see a bar fill up to the appropriate amount. Not very thrilling. Then there are the loot boxes, likely to be the most contentious aspect of Forza Motorsport 7 and for good reason—they’re a real drag. Not least because there’s nothing interesting in them. New clothes for your driver, mostly, plus “Mods,” a.k.a. tasks you can complete during a race to boost your credit earnings. 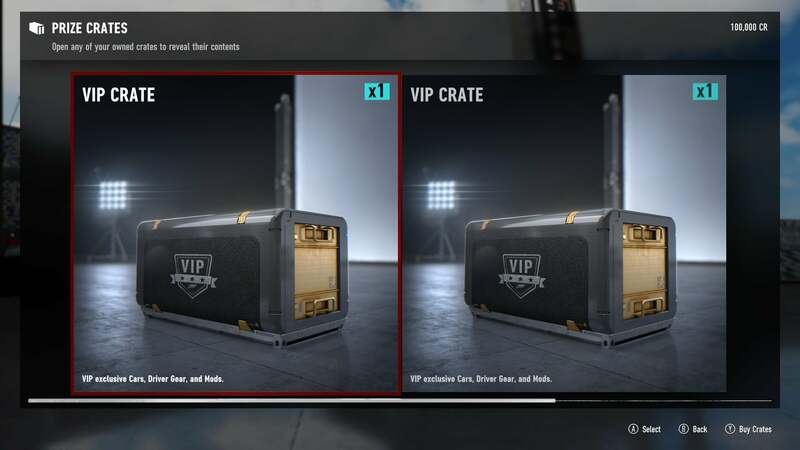 Like most bad microtransaction implementations, Forza 7’s loot boxes feel too worthless to be worth the credits invested, especially when those same credits are used to buy new cars. At the same time, it feels like not participating is slowing down how fast you progress through the game. Mods can easily triple how many credits you earn per race, rewarding you for completing “2/2 Good Turns” or “A Lap Without Leaving the Track.” When a normal race nets you 8,000 credits and the same race with mods nets 20,000—enough for a lower-tier car, essentially—you start to feel punished for not wanting to engage with its boring pseudo-gambling. So my complaints with Forza Motorsport 7 lie almost entirely outside the racing aspects. I guess that’s to be expected, coming from arcade racing. I’m not deep enough into the scene to talk about tire-wear models or anything like that—I find those facets interesting, and I can tell the difference when A/B testing Forza and Project Cars 2. Only in broad terms, though. In that respect Forza fits my needs, with its sim-lite ways. It’s enough of a sim to make me feel like I’ve put in some real time driving, while still forgiving enough that I don’t feel constantly frustrated. Performance is great, and the game looks pretty enough—particularly the skies. That Horizon tech is coming in handy. My feelings on the progression are mixed, though. Collection Score feels like a good idea that needs some refinement for the inevitable Forza Motorsport 8 (or even Forza Horizon 4 next year). But the loot boxes are a true stain, both too boring to be of interest to most people and too prominent to be ignored. Hell, the in-game announcer even directs you toward buying them at one point. That’s just...ugh.